The past two weeks have been a great time of reflection and thanksgiving. August 18 was the 50th anniversary of our marriage. 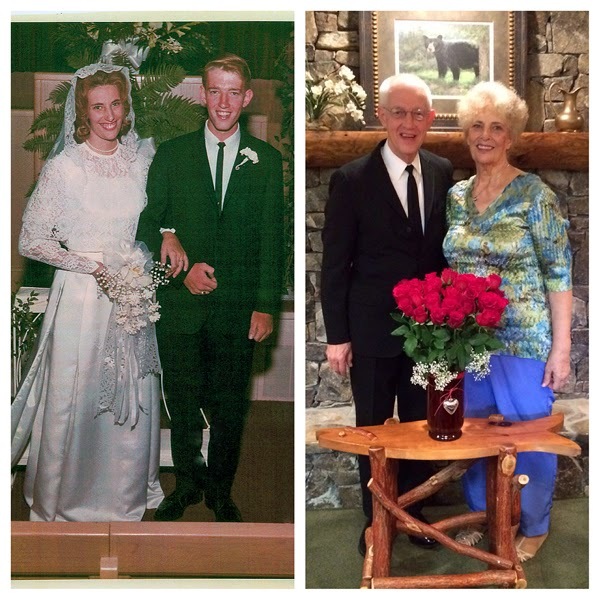 Gail and I were married August 18, 1964 at the Tuscumbia Church of Christ in Tuscumbia, Alabama. It was a Tuesday. How many weddings have you attended on a Tuesday afternoon at 5:00? Why would anyone do that? When we decided to get married, I was making $65.00 a month, preaching at four different churches. I couldn't afford to miss a Sunday. They told me we needed to practice for the wedding. We practiced on Monday, got married Tuesday, returned from our honeymoon on Saturday so I could preach on the next Sunday. On our honeymoon, we had $150.00 in travelers checks for the trip. We went to Rock City in Chattanooga, Gatlinburg, and Cherokee, North Carolina. On the way from Chattanooga, we had to replace a fuel pump in South Pittsburg, Tennessee. That was $20.00. We had a good time and returned home with a $10.00 travelers check. God has been good to us these fifty years. I am thankful for the Tuscumbia church for providing our wedding and reception. They had been Gail's and Brenda's (Gail's sister) sponsors at Childhaven since they came there in 1950. Our children and grandchildren, Jerrie Wayne Barber, II, Terri, Elizabeth, Jackson, Jeffrey, Whitney, Nathan, Dalton, Wyatt Houston and Christi, Brian, Brittan, and Braden Parsons, have been and continue to be a joy and blessing to us. We have been encouraged by ten churches were we have worked full time (five) and as an interim with five. I appreciate our children and grandchildren arranging our celebration this past Saturday at the Berry's Chapel Church of Christ. I am thankful to those who came, to those who wanted to come, to those who have contacted us through the U. S. mail, FaceBook, Twitter, and phone. Incidentally, on the Sunday before we were married, I tried out for a church to preach on Sundays and teach a class on Wednesday night. They asked me if I thought I could make it on $75.00 A WEEK! I told them I would do the best I could. That is what you call just-in-time delivery. God has been good to us. Brethren have encouraged us. I look forward to the future with faith. BE WATCHING FOR A CHANGE IN MY BLOG IN THE NEAR FUTURE!